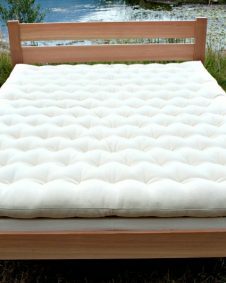 Add a wool filled Snuggle Mate to your mattress for additional cushion and to experience the benefits of wool. Wool will keep you warm in the winter and cool in the summer, while also helping to relieve back pains and arthritis pains. Feel your body relax and your heart rate slow down as you lie upon our pure wool topper. Snuggle Mates ship out within 1 to 2 weeks. Rush orders are available for an additional 10% charge. 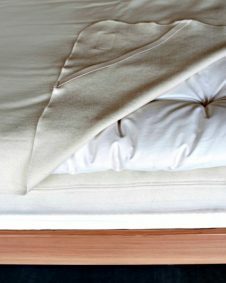 Our Snuggle Mate wool mattress topper consists of 3″ of our lush wool batting and is encased in a thick, soft cotton sateen. 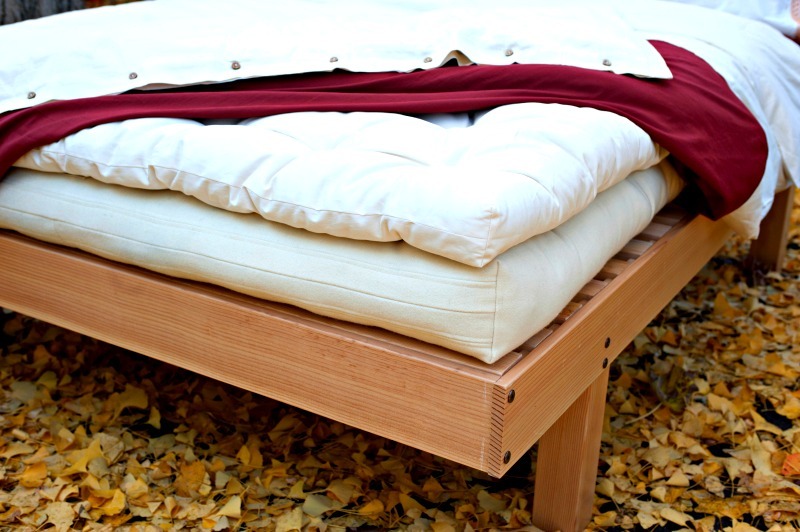 Add this topper to any bed to provide you with the comfort and breath-ability of natural wool. 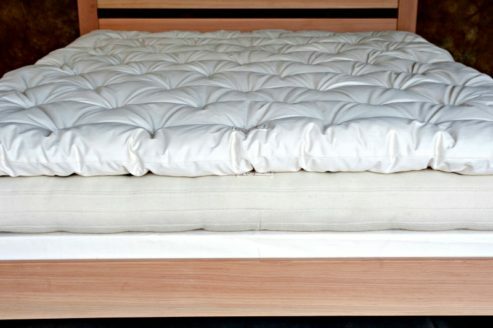 If you would like to add extra cushion to your existing mattress, this is the perfect item for you. 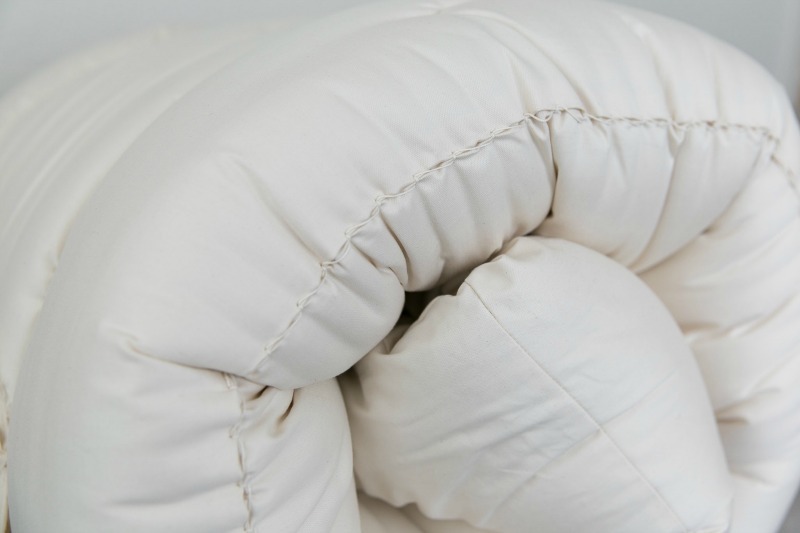 Lightweight and easy to care for, we highly recommend topping the all wool mattress with our 3” thick Snuggle Mate. Though this mattress topper will compress between 30% to 40% within the first 6 months of regular use, wool always retains its comfort and natural resilience. Add the Benefits of Wool to ANY Bed! 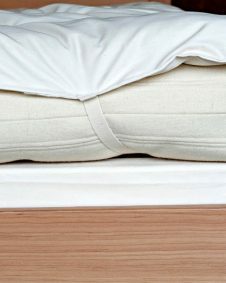 Wool-fill is the magical solution to differing comfort needs in partner sleeping. To receive ultimate breath-ability and comfort, combine the Snuggle Mate with our wool mattress, a 100% natural latex mattress or a cotton futon. 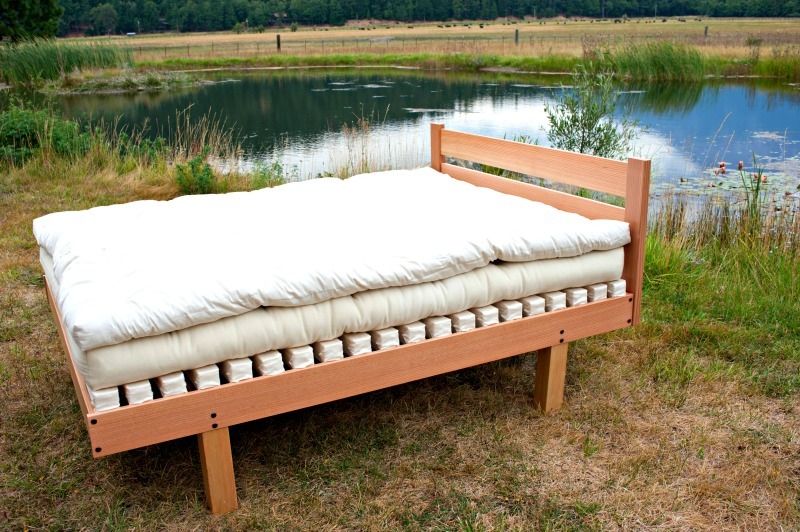 Wool is the ideal fiber for the sleeping body as it responds to your changing needs. 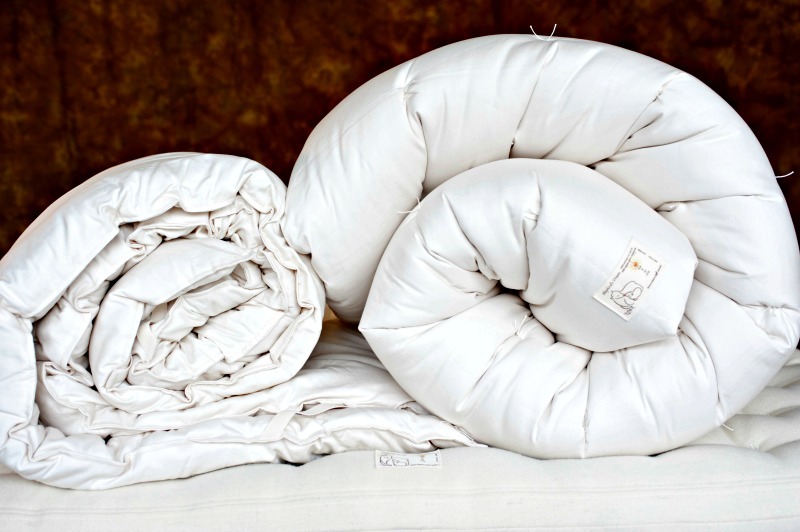 incredible comfort…wonderfully crafted…the snuggle mate is an amazing product…it cradles you like a baby…the wool just has this positive energy…it really makes your body feel good…relaxed…will never sleep w/o one again! This was nice to begin with, but it does compress, and the compression is uneven, mostly in the middle, leaving a dip in the bed. I think it might be a better product if it were precompressed mechanically and evenly. Love the snuggle mate! We have been using it on our king bed for 4 years and feels good as new. It’s named perfectly because when you crawl into bed you truly feel that you are snuggling in… It adds that extra warmth and comfort without compromising the feel of the mattress underneath. Feels cool in summer. We also have one for our baby bassinet (custom made) and child’s queen bed and have bought one as a gift for our nanny. Quality design and materials. Also LOVE the body pillow- it is a perfect shape for side sleeping or propping up your body for reading. I recommend these wool products to my patients for healthy body positioning and deeper sleep. You also must try the wool medicine felt- great for under your yoga mat or sleeping bag or on your couch- very versatile, beautiful and travels well. Thank you! We are so pleased that you are happy! Sweet dreams to you and your family! Add it to the 5 inch mattress and you’ll have the most comfortable bed ever! It’s soft and well made. Yay, happy to hear! I don’t know what I would do without my snuggle mate;) We appreciate your support so much! Thank you Logan for this great review and sharing your wife’s post! Sounds wonderful! So inspiring to hear from customers like you! Omigosh – I have had the mattress topper for almost 3 weeks and I LOVE it!! I bought this because I have had issues with lower back stiffness, even though the bed I have is supposed to be great for back pain. From the very first night, the stiffness in my back was gone!! 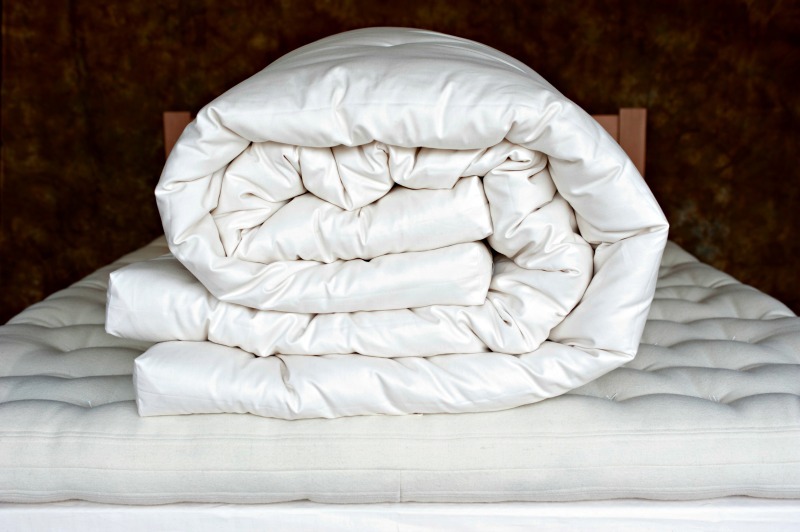 And, even better, I have had issues with being able to sleep restfully through the night for a very, very, very long time and, again, from the very first night I slept on the snuggle mate, I am sleeping so amazingly well…the difference is truly dramatic. I can’t wait to crawl into bed at night and “snuggle” in! !